Head and chest frontal portrait of a young peasant woman with a scarf over her head and a patterned shawl pulled about her shoulders. 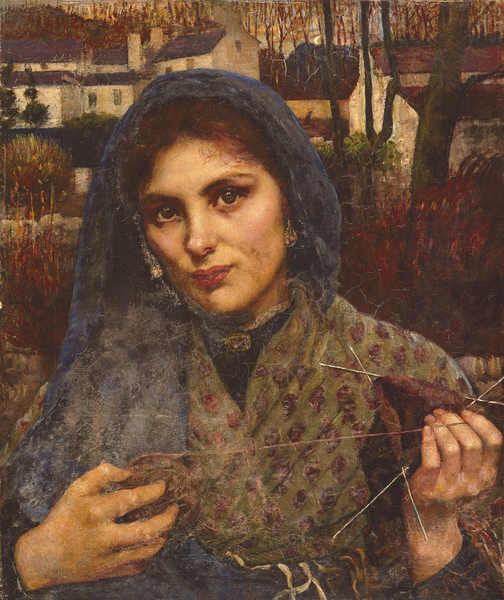 She holds a ball of wool in her right hand, a piece of knitting on three needles in her left hand, her head tilted slightly to the left, looking toward the viewer. Landscape background of white cottages amongst bare woodland trees.